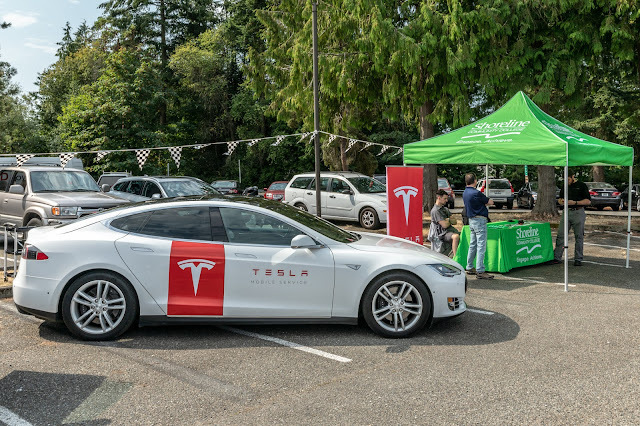 Beginning Fall 2018, Shoreline Community College will offer a training program from electric vehicle manufacturer, Tesla. The intensive 12-week technical training program, Tesla START, provides students with the skills necessary for job placement as Service Technicians at Tesla service centers across North America. Students will develop technical expertise and earn certifications through a blended approach of in-class theory, hands-on labs, and self-paced learning. Shoreline is currently just one of four community colleges in the United States that offers the program. “We are thrilled to be partnering with Tesla to provide this exciting new opportunity to our students,” said Guy Hamilton, Acting Vice President for Student Learning. Tesla provides the curriculum and instructors and works with students to provide job placement at a Tesla service center upon successful completion. With 76 Tesla service centers across the country and Tesla’s rapidly-expanding revolutionary Mobile Service program, Tesla START is designed to prepare students for a smooth transition from hands-on learning to full-time employment. Students will benefit from job-specific training, a chance to earn certifications while they learn, a job opportunity pipeline, and a foothold in the future of the automotive industry. Tesla’s mission is to accelerate the world’s transition to sustainable energy through all-electric vehicles and infinitely scalable clean energy generation and storage products. Tesla believes the faster the world stops relying on fossil fuels and moves towards a zero-emission future, the better. Ready to get started? Apply for the Tesla START program at Shoreline. The ideal candidate for the program is a graduate or soon-to-be graduate of a certified automotive education program with an interest in working on electric vehicles. For questions about the Tesla START program, email. Founded in 1964, Shoreline Community College offers more than 100 rigorous academic and professional/technical programs to meet the lifelong learning needs of its community.